The Paris Panthers finally arrived in their home town of Paris, France! With the Eiffel Tower majestically soaring in the background, the team felt some pressure being in the city they represent yet competed with pride. Team riders were Nayel Nassar and Gregory Wathelet. Nayel rode the first round beautifully and clear. The remaining rounds for Nayel and Gregory unfortunately ended with a few rails down. The team ended in 12th place for the Paris event and 12th place for the season. Jenn also competed in individual classes in the Global Champions Tour at Paris. Jenn gained great experience as well and was a huge support to the Paris Panthers team! You can watch both rounds for the team riders as well as the events for individual riders. The Evergate Stables team made a short stop in Knokke, Belgium for Hippique Week 3. Team riders were Jenn, Sayre Happy and Nayel Nassar. The team brought several Evergate Stables horses along to compete and increase their skill level. One of the highlights was Sayre competing on Celena VDL and finishing 11th in the 1m50 CSI 3* class! 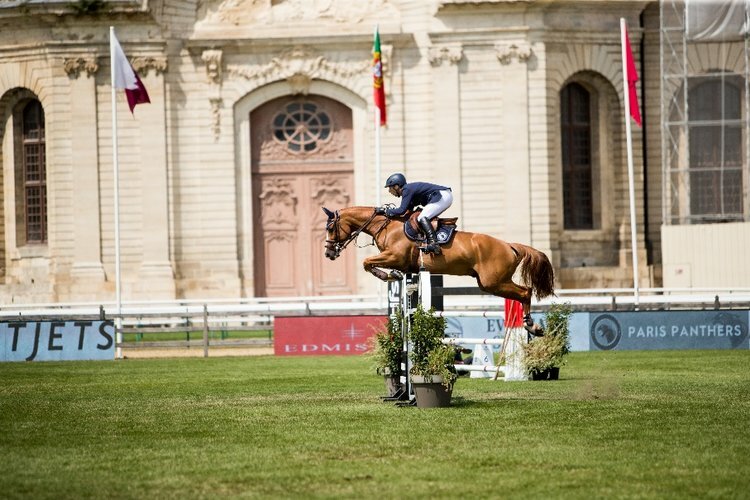 The Paris Panthers team left their home city to compete in the horse capitol of France, the elegant city of Chantilly. The large grass arena gave the horses plenty of room to run and test the time requirement of each course. Riding for the team was Gregory Wathelet and newest member, Yuri Mansur. Gregory tried hard but still had some difficulties with rails down in both rounds. Yuri however proved to be a great addition to the team riding both rounds clear! The team finished 17th for this leg of the tour and 14th place overall for the season. Jenn also competed in individual classes at Chantilly. Jenn had a great round on Dolinn in the Prix French Tour Generali CSI 5*, placing 13th! You can watch the team competitions as well as the individual riders. Part of the Evergate Stables team then traveled over to Switzerland for the Longines CSI 5* Ascona horse show. Jenn rode both Luftikus S and Alex in a variety of classes. Luftikus S rode clean and clear placing 3rd in two classes and then 7th in the 2* classes. Alex highlighted the weekend with his 10th place finish in the Premio Engel & Volkers Ascona CSI 2* Grand Prix of Ascona! It was a very successful show! While some of the team competed in Switzerland, other team members traveled to Spain! Sayre Happy competed with a few Evergate Stables horses at the CSI 4* Casas Novas horse show. One highlight was that Sayre rode Lorena 141 in the Trofeo Marques De Riscal CSI 4* class and placed 7th! The Evergate Stables team came back together in Lier, Belgium to compete in the Azelhof horse show. Jenn competed in CSI 3* classes against many competitive riders. She had some great finishes riding Luftikus S and placing 17th in the Grand Prix Flandria Rent 1m50/1m55 Longines ranking class as well as 14th place in the Prix Equnews 1m40 class! The Paris Panthers team pushed on to Berlin, the 12th location for the Global Champions League this season. With a small arena, riders and horses were put to the test. Yuri Mansur and Nayel Nassar rode for the team at this event. Both Yuri and Nayel had great rides for round 1! Both riders weren’t as lucky in round 2 however. After knocking down a few rails, the team ended in 11th place for the show, but holding on at 13th place for the season. You can watch the team in both rounds. The Evergate Stables team will make their return to Langley, Canada for the Summer Fort Festival. The event will take place August 21st – 26th. You can read more about the events and you can watch different events live. The Evergate Stables team will return to Europe to compete in the exciting Stephex Masters located in Brussels, Belgium. This event will take place August 29th – September 2nd. You can read about the venue, see the schedule and watch live.